ESPN / YouTube‘The Dan Le Batard Show with Stugotz’ started off the MLB season with some hearty laughs. The ESPN radio show “The Dan Le Batard Show with Stugotz” was covering the first pitch of Opening Day as the Miami Marlins faced off against the Chicago Cubs on Thursday. Cubs outfielder Ian Happ hit a home run on the first pitch of the year, leaving the Miami-based show to devolve into hysterical laughter at the Marlins’ misfortune. Baseball season got off to a quick start on Opening Day, with Chicago Cubs center fielder Ian Happ hitting a home run Thursday against the Miami Marlins on the very first pitch of the season. 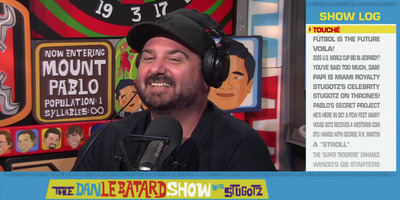 The ESPN radio show “The Dan Le Batard Show with Stugotz” was covering the first play live, with a producer, Billy Gil, calling in from the game. The Miami-based show had been critical of the Marlins through the offseason, as the new owner Derek Jeter gutted the team’s assets to rebuild the roster from scratch. You can listen to them revel in the home run below. Things worked out as well as Le Batard could have imagined for the radio spot, and if the moment is any indication, the Marlins are in for a long season.